Our final gift guide for 2010 highlights our home staples that help us live a “cleaner” life. Remember, you may click on the images of the products to buy directly from Amazon. Happy Holidays from the team at The S File™! I just discovered this new line of teas by The Republic of Tea. I love that an expert in teas has removed the thinking out of how best to benefit from them! From the title — like Get Clean (to detox), Get Gorgeous (to improve your skin), Get It Going (for constipation), and many more, The Republic of Tea has made it much easier to know which blend of teas is best for our needs or desires. Just select your objective from among the many fun selections (others include Get Lost (to lose weight), Get A Grip (for PMS / Menopause), Get Happy (to lift your spirit), Get Relaxed (to relieve stress), and more)! After being possessed by cravings from pregnancy and nursing for the past 1.5 years, I’m excited to enjoy Get Clean ! In reading a book about how the first nine months of one’s prenatal life shapes the rest of one’s life, I read about the prevalence of BPA in everyday products. When I read that it exists in our coffee makers, I immediately stopped using our regular, mostly plastic, coffee maker. 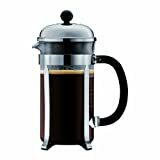 Instead, I started using a glass and stainless steel French press that a friend had given me. (The Bodum Chambord is an extremely popular one.) 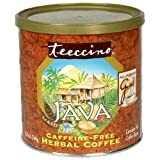 Since I’ve been trying to cut down on coffee, the French press has worked perfectly for my daily herbal coffee (Teeccino, below), regular coffee, and teas. It’s also great for entertaining since you can brew the drinks right at the table! I’ve been loving this herbal coffee lately, even preferring it to regular coffee! My recent flavor of choice has been Chocolate Mint. The ingredients (which provide a sense of the ingredients for the other flavors) are: roasted organic carob, organic barley, chicory, organic dates, organic chicory, almonds, natural chocolate flavor, organic figs, organic cocoa powder, organic peppermint leaves, peppermint oil. This is the best coffee substitute I’ve tried yet! I love these WallCandy stickers! My children’s room had been relatively dull since I’ve been paralyzed by not knowing how many kids would be sharing the room and therefore where the beds and furniture would be located. 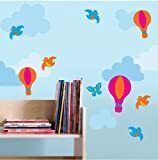 Wall stickers by WallCandy Arts allow us to decorate without commitment. I love it! The only downside is that re-using the stickers is so easy and fun that my three-year-old daughter is constantly redecorating her walls herself. Dr Bronner’s soap is a key staple in our household. We use either the liquid soap or regular soap to clean dishes, hands, body, hair, floors, and counter tops. 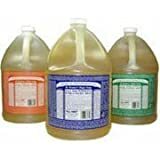 The company has been making organic Castile soap for over 60 years. I like that the company has been around for decades and it continues to be the first choice low-toxic cleaning product among those in the know. Indoor air quality is generally 2x – 5x more polluted than outdoor air due to off-gassing from various home furnishings, such as carpets, dust, mattresses, paints, etc. Written by NASA scientist Dr. B.C. Wolverton, who was a leading scientist in developing the biodome for the first astronauts to land on the moon, this book helped me realize how effectively plants can be in detoxing indoor air pollutants, even those from synthetic chemicals. It’s helpful in identifying which houseplants can detox your home and how to care for the plants. Click on Indoor Air Quality to learn more about the power of plants. Coyuchi is a California- based company that has been making organic cotton bedding and bath linens for 20 years. Their cotton is farmed without the use of pesticides and Coyuchi is dedicated to improving the lives of their farmers which makes giving the gift of luxurious, organic cotton all the better. Their towels, robes, pajamas, baby clothes, and beautiful embroidered bedding for cribs are truly wonderful products. I recently indulged myself by buying a Coyuchi organic bathrobe, which is luscious! The founders of Method, a company that makes healthier cleaning products, wrote their first book in 2008, raising awareness on the presence of toxic chemicals in cleaning solutions. Generally, the information available on how to detox your home is overwhelming, but this book does a great job of distilling the key concerns and highlighting high-impact changes you can make. This is a great gift to get someone started on detoxing their home! How do you keep your home clean? What are your favorite low-toxic items for your home? Share your suggestions below! Check out The S File’s other Gift Guides: Health, Pregnancy, and Parenting. Next post: Organic Sheets for Children: They’re On Sale!